On July 21, 1969, the Apollo XI mission on board the Lunar Module Eagle landed on the Moon for the first time. This Demonstration is similar to the classic videogame Lunar Lander in its recreation of this feat. You win if you land smoothly by pushing the controls without running out of fuel. Lunar Lander was first released by Atari in 1979. 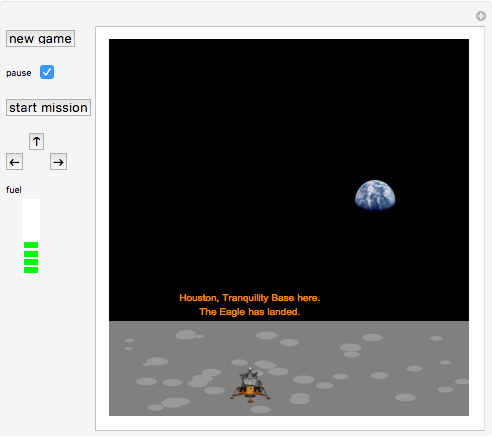 For an in-depth history of the game, see Forty Years ofLunar Lander. Lunar Lander ® and © 2006 Atari, Inc.